A favorite of American families, the best-selling 2018 Ford Explorer is a 7-passenger SUV that offers a large interior, powerful engines and all-wheel drive. Many advanced tech-based safety systems are available, and this year's updates include available onboard Wi-Fi. Comfortable and attractive, the midsize Explorer competes with the Chevy Traverse, Mazda CX-9, Hyundai Santa Fe, Toyota Highlander and Honda Pilot. With so many SUVs starting to look and act like minivans, the new Explorer bucks that trend with an upscale design, rugged stance and big horsepower. Plus, it seats seven and offers a wide range of trim and engine options, so there's an Explorer for almost any lifestyle and budget. Although the new Explorer is available with all-wheel drive and it looks like a Land Rover, it's not as off-road capable as that brand's many SUVs. If you plan to tackle anything beyond the gravel parking lot at an Eagle's concert, shop the Land Rover Discovery and Jeep Grand Cherokee. For 2018 Ford has updated the new Explorer with five new wheel options, including four 20-inch designs. There's also an available onboard Wi-Fi hotspot, and Ford has created the Safe and Smart Package that includes all of the available tech-based safety systems like Adaptive Cruise Control and Cross Traffic Alert. The Ford Explorer SUV for 2018 seats up to seven in its three rows, and the third row offers room for adults. The second row comes as either a 3-person bench, or it can be had with two bucket seats to ease 3rd-row access. Cargo space is generous. We're happy Ford has moved to using actual buttons for most controls, and also like the digital screen integrated into the gauges. The infotainment touch screen is a large 8-inch unit, and Ford's Sync 3 is easier to use than before and has become one of the more capable systems available. At first glance, the 2018 Ford Explorer bears a strong resemblance to a Land Rover Range Rover, pretty good company we'd say. Its standard LED low-beam headlights, grille and bumper give this mainstream SUV an upscale presence. It looks more expensive than it is. And its bulging hood, sculpted sides and flared wheelwells add musculature to the mix. No one will ever confuse the Explorer for a minivan. The Sport trim level is the most aggressively detailed with blacked out trim and grille and standard 20-inch wheels, while the Limited and Platinum trim levels dial up the chrome. When it comes to horsepower, the 7-passenger 2018 Ford Explorer SUV delivers at every level. The standard 290-horsepower V6 is strong enough for most buyers, and the 280-horsepower turbo 4-cylinder is powerful but also impressively fuel-efficient. Need more "oomph"? Try out the Sport and Platinum trims' 365-horsepower 3.5-liter twin-turbocharged V6. All three engines give the Explorer excellent passing and pulling power, while its heavily weighted steering and taut suspension give this big SUV impressive cornering ability, especially the Sport and Platinum models with their 20-inch wheels. Although its high beltline and massive front bumper make maneuvers in tight quarters a bit harrowing, Ford has done an excellent job keeping road, engine and wind noise out of the cabin, and seating is both comfortable and supportive. The Explorer's adaptive cruise control works well, but we wish it offered fully autonomous braking like the Honda Pilot, not just collision warning. The Manufacturer's Suggested Retail Price (MSRP) for the 2018 Ford Explorer starts around $32,000 for a FWD base model with the standard V6 engine. The 2.3-liter turbo 4-cylinder adds about $500 to that total, while the all-wheel-drive system tacks on $2,200. We think the better equipped XLT is a better entry point, at its base price of about $35,000. If you're looking for more power, the twin-turbocharged AWD Sport and Platinum models start around $46,000 and $54,000, respectively. That's competitive with the Nissan Pathfinder, Toyota Highlander, Honda Pilot and Hyundai Santa Fe. The KBB.com Fair Purchase Price helps you get a good deal by telling you what other Explorer buyers in your area paid. Note that the Explorer's resale value holds up better than the Dodge Durango, and is right in line with the Chevrolet Traverse and Pilot, even if it's less than the Highlander. The 2018 Ford Explorer SUV comes in five models: base, XLT, Limited, Sport and Platinum. Base models come standard with the 290-horsepower 3.5-liter V6 engine, a 6-speed automatic with steering-wheel-mounted paddle shifters, LED low-beam headlights and LED taillights, 18-inch wheels, and a rearview camera that incorporates a washer to keep the lens clean. Other standard features include cruise control, air conditioning, a 6-speaker audio system, and Ford's Sync infotainment system. Ford's MyKey allows drivers to program top speed and other parameters to help prevent young drivers from behaving recklessly. Other safety features include trailer Sway Control for easier towing. Moving up through the model lineup is the best way to get more on your new 2018 Explorer. The mid-level XLT is a good value, offering leather seats, navigation, blind-spot detection, inflatable rear seatbelts, dual-zone automatic climate control, and a dual-panel moonroof. Base and XLT models can substitute a more fuel-efficient 2.3-liter EcoBoost 4-cylinder, which is standard on the Limited model. AWD is available across the board, regardless of your engine choice. The Sport and Platinum models come with the twin-turbo EcoBoost V6 and all-wheel drive plus high-end leather, a premium audio system, leather-covered dash and other luxury items. This clever system allows the Explorer to practically park itself. It uses ultrasonic sensors to help parallel-park the SUV and park-out assist to help drivers pull out of parallel-parking spots. The system controls the steering wheel, while the driver operates the accelerator and brake pedals. Standard on the Limited, Sport and Platinum trim levels, this feature allows you to open the Explorer's tailgate without dropping your Costco purchase and pulling the key fob from your pocket or purse. Just a wave of your foot under the SUV's rear bumper opens or closes its hatch. The standard 290-horsepower 3.5-liter V6 on the Ford Explorer is fine for most people, offering plenty of power and acceptable fuel economy. However, the turbocharged EcoBoost 2.3-liter 4-cylinder engine is popular because it offers notably more torque and more miles per gallon. Standard on the Sport and Platinum models is the twin-turbocharged EcoBoost V6, bumping power up to a more-than-adequate 365 horsepower. With this engine, the Explorer is just plain fast. Sport and Platinum models also get standard all-wheel drive, but Ford's AWD system and its Terrain Management System with settings for sand, mud, grass and gravel are available on all models. Additionally, all models use a 6-speed automatic transmission complete with paddle shifters on the steering wheel. A favorite of American families and the country's best-selling SUV for nearly three decades, the 7-passenger 2018 Ford Explorer offers a large interior, upscale design and all-wheel drive (AWD). Many advanced tech-based safety systems are available, including active cruise control and a lane-keeping system which vibrates the steering wheel if you drift out of your lane. This year's updates include available onboard Wi-Fi. Five trim levels are available, base, XLT, Limited, Sport and Platinum, and Ford offers three engines including a 3.5-liter twin-turbocharged EcoBoost V6 making 365 horsepower. A 6-speed automatic and front-wheel drive (FWD) are standard. Understated and elegant, some say the new Explorer looks like a Land Rover. Its competition includes the Chevy Traverse, Mazda CX-9, Hyundai Santa Fe, Toyota Highlander and Honda Pilot. 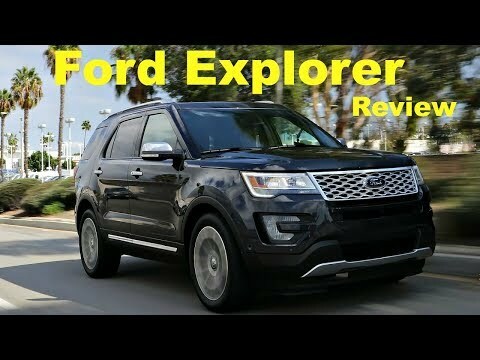 Title: 2018 Ford Explorer is great for families! I love the fact that my Explorer is highly up to date with technology and I am able to access my iPhone though the Explorer computer system. I can pull up maps, and listen to iTunes hands free. The third row seating is wonderful since we just had a baby and all 4 kids can ride comfortably, and we are still capable to put bags and a stroller in the back. We did not go with the leather seats, and I do not mind- the upholstery is easy to clean. . . Although I would have preferred the leather in the long run. The only complaint I have would be all the additional options such as a sunroof or heated seats were in the higher packages. I would have loved to have had heated seats on all the options. Great for the traveler or the soccer mom. Size is great for a 4 person family, we do a lot of traveling and even with two car seats have plenty of space for luggage and passengers. Leather heated seats and steering wheel is great for the cool months of the upper Midwest winters, and easy to clean and care for. The gas mileage is about average for the size of the vehicle and engine. The front seats are multi positional and makes for a really comfortable drive. Navigation is included for the life of the vehicle which is wonderful when you do not have unlimited data to use a phone GPS, and includes easy navigation tools and shortcuts, my favorite especially when traveling is the nearest gas stations with price compare. We own a beautiful Ford Explorer. My Ford Explorer is fully decked out for comfort and technically. It has heated seats and cool seats. It even has a heated steering wheel. It has duel controls for each. It has all the comfortable anyone would want for traveling. It has ambient lighting, which is awesome. It has a beautiful leather interior. We have three rows of seats and the middle seat are buckets. That is very handy with the grandkids. It has lots of safety features, which makes it a very safe vehicle. It has a wonderful, easy to use GPS system. We can also use our Alexis in our truck. We have owned several ford's and honestly wouldn't drive anything else. It is a very nice looking SUV. We love it.